SYNTHA-6® is a quality protein supplement in powder form created to supply the body with the necessary amount of protein your body needs for the day. BSN SYNTHA-6® and BSN SYNTHA 6 ISOLATE are two protein formulations that can provide you with adequate amounts of your daily protein requirements while going about the job in two different ways. If you have done your homework, then you know how crucial protein is to your physical fitness. Those who are unable to include sufficient amounts of protein in their diet have difficulty getting the body they want. Fortunately, you can always count on BSN SYNTHA-6. Whether you’re into competitive sports or want have the best workouts each time, you need to include quality protein in your diet. Unfortunately, most of us either have little or insufficient amounts of protein and this can lead to its deficiency in the body. Protein does more than repair muscle tissues; it’s also responsible for muscle contraction. In addition, proteins repair red blood cells and regulate hormone secretion while maintaining water balance in the body. Protein also promotes nail and hair growth, transports nutrients, trace minerals and vitamins to and from the cells, regulates blood clotting, aids in the digestion process, strengthens the immune system against infections and diseases, and transports oxygen. Fortunately, there is SYNTHA-6® for those who lack the recommended daily allowance (RDA) for protein. SYNTHA-6® is a quality protein supplement in powder form created to supply the body with the necessary amount of protein your body needs for the day. You can easily incorporate it into your diet or lifestyle and not have any qualms about taking it because of its delicious taste. BSN SYNTHA-6® and BSN SYNTHA 6 ISOLATE are two protein formulations that can provide you with adequate amounts of your daily protein requirements while going about the job in two different ways. BSN SYNTHA-6® is usually taken in the morning or as a snack option. It can also be used as a post workout recovery shake or taken any time during the day. The isolate version, on the other hand, is made from 50% whey protein isolate and 50% milk protein isolate, a source for amino acids called casein that is responsible for the synthesis of muscle protein or MPS. Ingredients may vary slightly for different flavours of BSN SYNTHA-6®. As you can read from the label’s ingredients, there are multiple blends of branch chain amino acids, glutamine, and proteins in each bottle of BSN SYNTHA-6® to promote muscle growth and repair. Furthermore, the presence of glutamine in this supplement supports the body when processing the repair of muscles and tissues after an intensive workout session. Not to mention the great fibre and digestive enzyme value that come with it to assist protein breakdown and digestion to reduce side effects like gas, bloating or stomach upset. A weight watcher will have greater success by taking the Syntha 6 meal replacement option rather than adding it to an existing meal within their diet. In fact, according to a study published in Journal of Nutrition, a meal replacement is not only as effective as other weight loss strategies but also offers more convenience and has a much higher rate of commitment in following through on your weight loss goals. A study published in the International Journal of Obesity revealed that meal replacements, like Syntha 6, are more effective in the reduction of abdominal fat in comparison to conventional meal replacements. There are many Syntha 6 results you can expect such as the delay of the digestive process for even and gradual distribution of proteins as well as carbohydrates contained in each serving. This enables greater consistency in the rate at which amino acids are released into your bloodstream, so that your muscles have the time to develop, repair, and re-grow properly. In slowing down the release of amino acids, there’s no possibility of having a glucose surge in the bloodstream. With lower levels of blood glucose insulin is prevented from being released in your body in mass quantities to become stored as fat. For this reason, Syntha 6 is a safe post-workout/pre-bed protein that continues to work on your muscles even as you sleep. 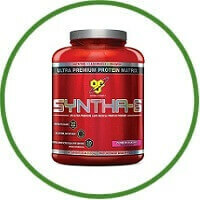 The nutrient profile of this supplement makes it very versatile inasmuch as ingesting Syntha 6 pre workout provides the same benefits as taking Syntha 6 post workout, in-between meals or as a midnight snack. And that’s not all, because the delicious flavours of BSN SYNTHA-6® – including the decadent Chocolate Peanut Butter and Chocolate Mint – won’t make you feel deprived of sweets at all. A good product is only effective at producing successful results and satisfaction when used according to the recommended directions. These side effects are more likely to happen when you exceed the correct dosage. One thing is certain, though, BSN SYNTHA-6®, in spite of its delicious taste, has no aspartame that can cause diabetes, seizures, cancer, and emotional disorders even after prolonged use. Based on customer reviews, BSN SYNTHA-6® users are in a quandary over which of its delicious flavours is the best. Some say it’s Cinnamon Bun and others believe its Mochaccino. Based on Amazon customer reviews, 980 of 1,298 gave Syntha 6 Cookies and Cream flavour a rating of 4.6 stars out of 5. Many users even include BSN SYNTHA-6® as an ingredient in their smoothies and pancake batter, make it as a shake or substitute it in a recipe that requires milk or cream. In fact, there are an increasing number of users who come up with a basic Syntha 6 proat recipe which they include in waffles and oatmeal cookies. To ensure that you get the authentic BSN Syntha Six protein powder supplement and BSN SYNTHA-6® ISOLATE, buy either or both products only from authorized distributors. On a final note, here is something for you to ponder if you are hesitant to try Syntha 6 because of how much it is. While its price is not astronomical, Syntha 6 is an ultra-premium product made from the highest quality ingredients that yields proven and effective results. Alternatively, we recommend you buy BSN Syntha 6 from a reputable online health store such as Monstersupplements.com, Bodybuilding.com or Amazon.com. Beware of those who sell Syntha 6 cheap because these sellers are, in all probability, unscrupulous scammers who will sell you a bogus or facsimile product and run away with your money.